Earth Contact Products’ Steel Piers™ were selected to support and restore this office building after the owner determined that the entire structure had settled between 1/8 inch and 3-5/8 inches. The settlement was most likely caused by consolidation of fill soil on the lot. 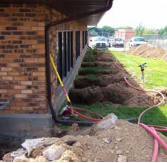 Merit Structures and Restoration Company from Midvale, Utah installed ninety-seven ECP Model 350 Steel Pier™ systems to recover lost elevations. 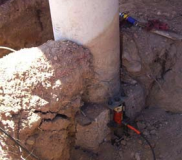 The Model 350 ECP Steel Pier™ System installed here used a 3-1/2 inch diameter tubular steel pier that was hydraulically driven to as deep as 54 feet below the footing to reach a geologic stratum that provided the suitable end bearing for supporting the structure. 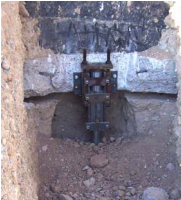 Each pier was advanced through the consolidating soil until the pier encountered firm load bearing. Once reached, each ECP Steel Pier™ was field load tested against this bearing stratum to a force greater what was required to support the structure. Field load testing each pier after reaching end resistance verified that the bearing stratum was suitable for long-term support. 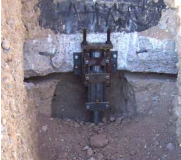 This load testing also determined a factor of safety for each pier placement against future settlement. 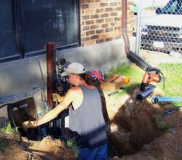 In the case of this project, the field test loads were on average 155% percent above the working load requirements providing an average factor of safety over 2.5! 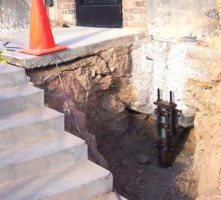 At each pier location, a pier bracket was attached to the foundation. 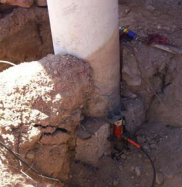 Once all piers were installed to end bearing and the load capacity verified, the structural load was transferred from the failing soil under the structure to the verified bearing stratum deep below the surface. 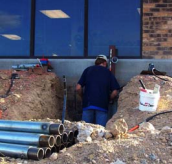 This gentle and uniform load transfer was accomplished by banks of hydraulic jacks that were all connected through manifolds to electric hydraulic pumps. One jack was installed on each pier bracket to accomplish the load transfer and recovery of lost elevation. There was minimal disturbance to the building’s occupants during the restoration process. 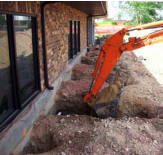 Because ECP Steel Piers™ were installed using quiet, vibration-free hydraulics, it was “business as usual” in the office during the underpinning installation. Photographs: At the top is a view of the settled structure showing the large depth of fill below the foundation. At top right, the excavations are prepared at pier locations along the perimeter of the structure. 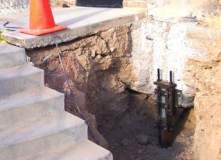 Above right shows how the foundation was prepared for mounting the pier bracket. 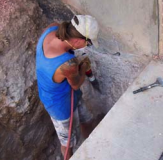 The technician is smoothing the face of the stem wall. 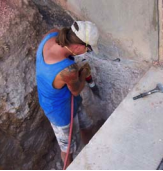 The bearing area under the footing was also similarly prepared. 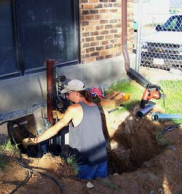 At right a technician installs one of the drive stands that were used to advance the pier pipe through the soil to end bearing. Photographs: Above the technicians are installing pier pipe using quiet and vibration free hydraulics. At left center, the structural load is being transferred from the concrete footing to the pier systems using multiple hydraulic jacks. At left, one can see how the columns were lifted along with the building. One steel pier was situated on each side of the column footing making lifting the columns a simple procedure. The photo at bottom left shows how recovering the lost elevation was accomplished. 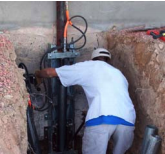 All hydraulic jacks were connected together through a manifold system and actuated using electric pumps for gentle and uniform lifting. Below are views of two Model 350 ECP Steel Pier™ placements. Notice amount of lift accomplished on this project and the final configuration of the pier system.